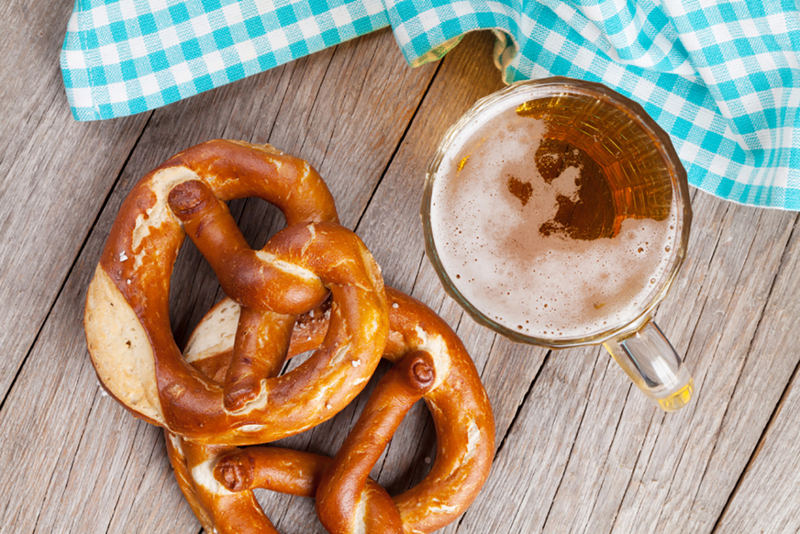 Octoberfest is the perfect excuse to whip up these easy grilled pretzels! They pair perfectly with a good German beer and mustard based BBQ sauce! Prepare you Hasty-Bake for grilling. In a large mixing bowl, mix Bisquick and milk until a dough forms. Beat vigorously for about 10-15 seconds. Gently smooth into a ball on either the counter top or plastic cutting board dusted with baking mix. Knead 4-6 time then divide into 8 equal parts. Roll into a 15-inch long pieces . Place them one by one on a large sheet of heavy-duty aluminum foil. Bring left end of dough up over the first loop to form a pretzel shape; press end into dough to seal. Enlarge the holes in the loops with fingers. Brush one side of each pretzel with egg white and sprinkle with kosher salt. Grill pretzels on aluminum foil until golden brown, about 5 to 7 minutes. Serve with South Carolina style Mustard BBQ Sauce.